Cmon D terrible attempt at taxkling there!! Loved Barkley at Penn St. Not so much now. 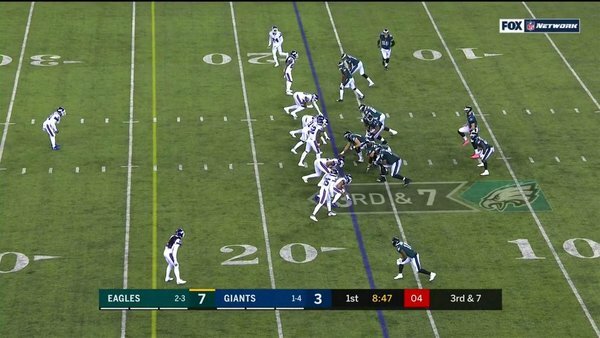 Giants settle for 33-yard FG after Eagles aren't called for pass interference after Sidney Jones trips the WR when feet got tangled. Eagles regain possession with a 7-3 lead. Eagles defense now has given up points on opponents' second possession in three of six games. I don’t want Shady back either.. if your going to trade for a RB do it for one that’s in his prime! Shady will be owed $9mil next year at 31. Avonte Maddox chased down Adam Theilen last week, Saquon Barkley tonight to prevent TDs. He might be undersized, but the speed he's giving the Eagles as the deep safety helps. Shady's too old and used goods now. Don't want him. That play had no chance of working. Great alert play by Agholor. @Chris.... teams are doing short passs to counter our pass rush.. it’s tough. Good awareness by Agholor to chase that pass down for a third-and-long conversion. Eagles need it to be that kind of night. That catch by Agholor was fortunate, but... hey, take it. Jason Peters with holding. Leads the #Eagles with six penalties. Dag J-Pete!! You got SHOVED BACK!!! YOU???? Peters looks old and slow. So far two runs, both second and long stretch by Smallwood. Second one was minus-4 thanks to Seumalo. Carson Wentz has hardly any time on his drops. #Eagles are running vertical routes and he's looking, looking, but Doug Pederson may need to draw up some quicker releases with the way Jason Peters and Lane Johnson are protecting the edges. O line is still celebrating Super Bowl. How did we go from one of the best offensive lines to a line that can't block anyone in the seven months since the Super Bowl? They almost just got one. Michael Bennett got Eli Manning on the goal line and stripped the ball, but the Giants picked it up. I agree with Jeff. Not protecting, throw the short routes.